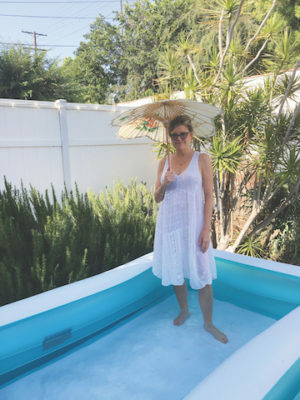 COOLING OFF: Resident Jill Galloway found relief in a neighbor’s kiddie pool when temperatures soared amid power outages. Angelenos battled a blistering three-digit heat wave with around-the-clock air conditioning July 6, but beginning around 5 p.m, aging infrastructure gave out, resulting in widespread power outages. Although power was restored for most neighborhoods within hours, Hancock Park, Windsor Square and Larchmont felt the consequences of the blackout for most of the sticky weekend, and local residents are now looking to effect change. At the weekend’s outage peak, approximately 3,000 local residences lost power. The impacted customers in this historic area outnumbered most other Los Angeles neighborhoods, in part because of older, underground infrastructure that is hard to access and repair. The local power infrastructure was built underground in the 1920s and serviced in the 1970s, making the wiring approximately 45 years old. Residents, such as Jill Galloway of the 200 block of North Irving, decided to brave the power outage Friday night. Temperatures remained high during the night, and some residents chose to settle in with friends or family, or in a hotel. According to locals, the power supply is cut often during times of disturbance, such as heat, wind or rain. Most residents assumed that the power would return shortly. Another common option over the weekend was to use a back-up generator. Steve Cohen, owner of Village Pizzeria on Larchmont, operated a back-up generator with the hope of maintaining business. The generator ran a couple of small refrigerators. Despite this extra power source, Cohen lost a significant amount of pizza dough, Italian ices and produce. He estimates that the power outage cost about $20,000 in total revenue. Los Angeles Department of Water and Power (LADWP) recommends that any customers with substantiated losses –– such as perishables –– fill out a claim form on its website. Applicants could be eligible for full reimbursements. “I lost sales, my workers lost payroll and tips, I lost some food, and I lost my mind from being overworked and hot and stressed and out of business,” Cohen said. The power remained off all-day Saturday. Owner of Pickett Fences on Larchmont, Joane Hennenberger Pickett did not open her store for a majority of the weekend. “We were closed for one and a half days and, as a small business, that is unfortunate as we do most of our business for the entire week during the weekend,” Pickett said. Power repairs took longer for most parts of Larchmont, Hancock Park and Windsor Square because of a splice explosion at a major distribution center. A splice explosion is when the connection between two large, manually bonded cables explodes. LADWP’s Chief Operating Officer Marty Adams says that the explosion damaged two other circuits next to it, causing greater delays in restoring power. Once crews fixed the splice, they discovered previously hidden power issues. IN early july, LADWP workers provided ventilation to the underground electric vault at 6th and Western. Furthering the frustrating effects of the power outage, locals were upset over the lack of communication from the LADWP. From July 2 to July 8, LA-DWP answered 47,379 telephone calls. Customers were put on hold for extended amounts of time, and the department offered generic information at best, according to locals. “The DWP was clearly overwhelmed, but that does not excuse the fact that they seemed unprepared and unable to forecast when they could reactivate the power,” Newman said. Ryu and his team also were not hearing from LADWP. “We frankly weren’t getting enough information with DWP about what’s really going on,” Communications Deputy Mark Pampanin said. LADWP’S Adams says that the department is actively working to improve its communication systems for heat waves. “We’re working to try and view it more as an emergency and be able to communicate more like that. I think, with that, we should be able to tell our customers more accurately what to expect and what they should plan for,” Adams said. Many locals turned instead to the website Nextdoor, a social networking service for neighborhoods, to receive the most recent power outage information. Neighbors often had conflicting details from LADWP. Locals began brainstorming solutions even before the power was completely restored. A petition to “Update and Enhance the Windsor Square and Surrounding Areas Power Grid” gained attention on July 10, as well as requests to call elected officials, such as Ryu and Mayor Eric Garcetti. Locals also questioned annual money transfers from LA-DWP to the city budget. Last November, the city took $242 million of ratepayer money to balance the budget, despite the department falling short of self-projected yearly repair goals. According to Adams, however, money is not a major issue for the department. The transfer of ratepayer funds to the city, a practice that dates back to the 1950s, has been budgeted into their financial plan. LADWP instead faces practical and structural limits that make it difficult to fix the power grid. “In the electrical industry right now, between trained skilled craftsmen, competition and the construction boom in the city of L.A., we are not constrained by money in terms of getting our work done. We’re constrained by just the difficulty of the job,” Adams said. In the Hancock Park area, the greatest issue with the underground infrastructure is the ductwork itself: there is no physical space for heavy-duty wires. New infrastructure is the next step, according to Adams, to fix the neighborhood’s power demands. In theory, crews can re-string new wiring from point-to-point underground, but the existing ductwork will not accommodate the newer, heavier cables. Ryu planned to introduce motions to the city council when the councilmembers returned from recess July 31. One such motion is to update public access to power outage information. “We want a process in which, once crews arrive at the scene, they can assess damages, understand it and give real-time updates directly to the public. We don’t think that they did a strong enough job at that part of it,” Pampanin said. Adams agrees and says that LADWP will be working with Mayor Garcetti to improve the department’s communication system. “That’s a little bigger nut to crack, but we have some ideas along those lines. In some cases, there just is no information to give out, but we do need to tell our customers a little bit what to expect as best we can,” Adams said. Another motion is to improve the city’s cooling centers. City officials opened several designated locations for locals to escape their overheated homes. LADWP is still analyzing the outage data and its procedures before finalizing any concrete next steps. “We’re looking at what can we do institutionally to actually work around limitations that we put either on ourselves –– whether it’s street construction limitations or our willingness to put customers out of power limitations –– or other things; things that will hopefully speed up the level of replacement,” Adams said. Locals can also be proactive in protecting against potential power outages. LADWP recommends setting thermostats to 78 degrees, limiting the use of appliances during peak hours of the day (2 to 9 p.m.) and unplugging “energy vampires,” like cell phone chargers, that use energy even when turned off or in sleep mode. Residents are also encouraged to communicate with LADWP through local neighborhood councils and homeowners’ associations to discuss infrastructure improvements. Thank you for that coverage! I especially appreciate the detail about some conduits being too small for modern cable, I had not heard that before.